The genius of C.S. Lewis continues to astound me. I read the Narnia series as a child and liked-but-not-loved them (although The Lord of the Rings has taken on new dimensions now that I am a practicing Christian, so perhaps I should revisit the world in the wardrobe, as well). But as an adult, Lewis’s nonfiction — Mere Christianity, The Abolition of Man, and The Weight of Glory — has consistently delivered new spiritual insights and deepened my conversion, and his fictional meditation on the afterlife, The Great Divorce, is one of my favorite books of all time. Which brings me to The Screwtape Letters. This little book has been on my shelf for quite some time, and my oldest son, Brendan, read it a year or more ago and loved it. The book, ostensibly, is a collection of found letters from the demon Screwtape, an experienced administrator in the bureaucracy of Hell, to his nephew Wormwood, a young tempter striving to lure a budding Christian away from salvation. The letters show the subtlety and patience of the diabolical, the insidious ways in which we are knocked off the straight and narrow path, and the relentlessness with which we are pursued by the “roaring lion looking for someone to devour” (1 Peter 5:8). I saw myself in nearly every letter, as Screwtape outlines the fledgling Christian’s typical stages of conversion and the best ways in which to turn his progress into regress. The book is darkly funny, which makes the medicine easier to swallow. For example, Screwtape admonishes Wormwood for being naively enthusiastic about the outbreak of war in Europe, saying that while human death and destruction are always to be praised and enjoyed, it is not, in itself, necessarily helpful in the damnation of souls, because A) it affords opportunities for men to exercise saving virtue as well as condemning vice, and B) it can end lives in an instant — snatching souls for the Devil just as easily as from God, and undoing years of patient temptation. He also advises his nephew that tempting humans to great and glorious wickedness can backfire into stunning conversions, and that small temptations that lead them slowly, slowly away from God — all unaware of the danger — is just as good for their Father Below, and besides that, more enjoyable for the skill required. This is definitely spiritual reading, which you can apply to yourself if you try. A brief example might suffice to illustrate this point: in one letter, Screwtape advises Wormwood on what a huge difference a seemingly small tweak in the language of his “patient” can have on the fate of his soul. He urges his nephew to encourage the man to think of his duty to practice charity as unselfishness. Unselfishness has the advantage, Screwtape says, of turning a positive attribute (charity) into a negative (UN-selfishness), and an external, active habit into something more akin to navel-gazing: inwardly focused, inactive, and a potential source of pride. She doesn’t even appreciate how unselfish I am! I don’t need his pity — two can play at this game! 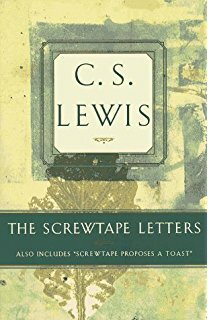 Like The Great Divorce, The Screwtape Letters led me to think more deeply about the little things that draw me daily away from God, and underscored for me that getting to Heaven is something akin to long-range marksmanship: a tiny deviation at this end can, over the distance of years, result in missing the mark entirely. Yet it never ceases to be hopeful: the demons admit they are at a disadvantage and cannot challenge God directly — and they have no understanding at all of charity, and dismiss it as a lie God has told in service of a secondary goal they have yet to discover. They cannot fathom why He loves us so. ← Season’s Greetings from the Thorp Gang, 2016 Edition!